If you have enough money to spare and you want to buy a wake-up light that has some of the best features in the market and combines it with excellent design and a premium look and feel, then the new model Lumie Bodyclock Luxe 700 is a top choice. It does not have any fiddly buttons that make using it awkward, it performed well during our test and has a lot of features that set it apart from other similar products in the market. This is the latest model for Lumie and it is a wonderful attempt at giving us something close to perfection. It comes with the standard range of features that a wake up light alarm clock typically comes with. You can set it to light up for up to 90 minutes after the alarm goes off. There are six bright LED lights under the glass top of the clock and you can also set different levels of the brightness which is convenient for your flexibility. You can also set it for sunset too to remind you of when to go to bed and the sunset sequence can also last from 15 minutes to 90 minutes. The light from the clock is bright enough to be used as a reading lamp. The wake-up clock comes with a snooze feature and allows you to choose up to 20 unique wake up sounds and alarms. There is an option for white noise too. There are some features that allow the Lumie Bodyclock Luxe 700 stand out from other wake up lights that we have tested recently and these include a built-in USB port and Bluetooth connectivity. The USB port is useful for charging your phone. The wake-up light also supports music playback through its built-in speakers. Even though it does not come with a FM radio feature, you can still use your phone to play music and any application from your phone to stream your favorite music and radio channel. You can also connect to your phone or music player using Bluetooth so there are several choices for you according to what works best for you. You can even set it up such that you have different wake up times for up to seven days in the week, all having different alarm sounds. The Lumie Bodyclock Luxe 700 is also certified as a Class 1 medical device and has been verified to have beneficial effects on those suffering from Seasonal Affective Disorder and winter blues. Real Demonstration of the Lumie Bodyclock Luxe 700. The Lumie Bodyclock Luxe 700 is one of the most stylish wake-up lights when compared to other Lumie wake up lights. It has a symmetrical orb shape and has a distinctive front face. The dials and the row of buttons makes it look like a smiling cat. Behind the clock is a USB port that you can use to charge your phone or play music from a USB storage device. There is also a 3.5 mm auxiliary port and another port for headphones. The black and white combination is very classy and goes well with the blue display area in the front. The Lumie Bodyclock Luxe 700 has a fading blue light which acts as a light during bed time. It is always at the lowest setting so it does not disturb you while sleeping. Overall, it looks attractive and does not take too much space on your bed stand. Setting up the Luxe 700 takes a bit of time. The front of the clock has four buttons that control the alarm, the sunset mode, audio source and a menu button for accessing settings. After accessing the settings, the two dials on the front are used for navigation and choosing options. This control scheme works well but you should be careful when rotating the dials to avoid speeding past your desired options. You have the option to set your alarm each day or weekly. If you are setting for the week, the menu takes you through each day. This is convenient if you have a set time you wake up each day but if you have different wake up times frequently, then you can just make use of the daily alarm settings. 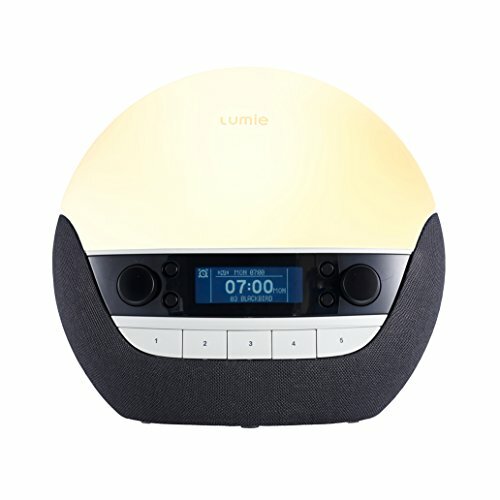 The Lumie Luxe 700 wake-up alarm clock is an upgrade over everything that the other models do in that it gives you more options in terms of morning and evening usage, more sound options and plenty of sound effects as well as white noise. It can also double as a speaker system, a charging point for your mobile phone and still tells you the time. The built-in LED bulbs means you hardly ever have to change the light source. Despite its price, it works for everything it is meant to do and is amazing at it in a stylish design and package. Efficient wake-up alarm: The alarm is very effective as well as the lights both as sunrise and sunset. Lots of sound effects and white noise: The Lumie Luxe can set different wake-up sounds for each day of the week and has the option for white noise effect. Cost: It is quite pricy compared to the other models of the Lumie Luxe line of wake-up clocks.